Russian retailers still hope 2014 will mark their turn in the spotlight of international finance, but tensions over Ukraine cloud the picture. Russian retailers looked set to lead the charge into equity capital markets in 2014 after Lenta, the country’s second-largest hypermarket retailer, sold almost $1 billion worth of shares in London and peers readied plans to follow suit. Once the crisis erupted, Lenta’s shares took a hit and Russian firms started to wonder if 2014 would really be their year after all. Although Russian economic growth has flagged and the country’s central bank has sought to tamp down inflation at the expense of economic growth, many observers have looked to retail as a bright spot in the economy. Russia is set to become the ninth-biggest retail market in the world in real terms by the year 2020, the Euromonitor research group has predicted. Russia has already emerged as Europe’s largest retail market in several categories, from cars to cell phones to baby care products. The year 2012 “was a record year for new store launches with more than 3,000 new retail spaces of Russian grocery chains coming into operation,” the Euromonitor research group wrote. With all that momentum, Russian retailers had been looking to list shares and use the proceeds to fund further expansion. As the year began, expectations ran high for three main players: Lenta, Detsky Mir (the country’s largest children’s retailer) and the Russian division of Germany’s Metro AG. 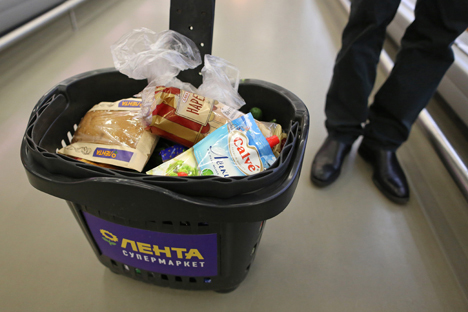 Of those, only Lenta managed to hit the market before the Crimea crisis erupted. The other two are now watching the market and waiting for their moment. Lenta’s 77 hypermarkets cater to the sparsely populated regions outside Moscow while its 21 supermarkets operate primarily in the densely packed and pricey Moscow region. Lenta, one of Russia’s fastest growing retail chains, had been valued between $4.09 billion and $4.95 billion based on evaluations between $9.5 and $11.5 per global depositary receipt. Hypermarkets, a combination of department store and supermarket familiar to U.S. shoppers in the form of Walmart and Target, have been a success in the Russian regions due to low competition and cheap goods bought through its rewards program. Loyalty cards are used in 90% of all purchases at Lenta, with 4.8 million active card users. The company’s Feb. 28 listing on the London Stock Exchange, however, came a day after armed men seized control of the Ukrainian region of Crimea, sparking an international crisis between Russia, Europe and the U.S. Lenta shares, which debuted at $10, dipped to $9.85 at the close of their first day, as doubts rose about the ability of future Russian retailers to follow suit in the near term. The Russian unit of Germany’s Metro AG, the fifth-biggest global retailer, planned to follow in Lenta’s footsteps. In January, the company announced it would list a share of its Russian Cash & Carry business in the first half of 2014 on the London Stock Exchange. Metro’s Russian business has been robust, with 72 stores bringing in $5.09 billion in sales in 2013. Money raised in the IPO would have gone towards expansion and to pay off debt. By late March, the IPO was officially on ice. In mid-March, Detsky Mir also postponed IPO plans indefinitely, Bloomberg News reported, citing unnamed people familiar with the matter. The company has been considered a strong IPO prospect as the largest children goods retailer in Russia. In 2013 Detsky Mir’s revenue grew 28% to $1.13 billion. The company, whose name translates into English as “Children’s World,” applied in February for permission to list outside of Russia. However, even if the listings are postponed, Russian retailers can be comforted by falling back on their core business in Russia. “We expect consumers to become more price sensitive and therefore migrate to lower-end stores,” says Elizaveta Lebedeva, a consumer goods analysts at Moscow brokerage Aton. “Food retailers have a rather low level of imports, and large food chains are able to buy goods directly abroad, bypassing the importers,” Ms. Lebedeva notes. As Russian retailers gear up for IPOs, local grocer Magnit seems to be the example they aim to follow. Magnit, Russia’s largest grocery retailer, went public in 2006 and engineered a successful secondary offering in 2009. By 2012, its total value on the London Stock Exchange exceeded $21 billion, with shares rising 65% in 2013 alone. In January, Magnit CEO and principal shareholder Sergei Galitsky told investors that he expects sales revenue to grow 22%-24% this year, after net profit rose 38% to $1.1 billion, according to Interfax. “We want to be a secure investment, a little bit like a bond,” Mr. Galitsky, who together with management owns 50% of Magnit, told the Reuters news agency in September. The company’s motto, “Always Low Prices,” exemplifies its success in luring thrifty provincial Russian consumers away from more traditional open air markets, with almost two-thirds of stores located in towns with populations lower than 500,000. Its high-tech automated ordering system and expansive logistic network of over 5,000 vehicles has also kept costs low in a business where margins are of the utmost importance. Founded in 1994 in the southern grain town of Krasnodar, Magnit began as a wholesale chemical distributor before expanding into food retail in 1998. Company founder Mr. Galitsky has long been seen as an owner focused on the long-term, involved in the details of the business and responsive to investors’ concerns. In 2012 he was named best corporate manager by the Investor Protection Association, an international body focused on bringing better corporate governance to Russia. Mr. Galitsky, whose personal wealth is estimated at $10.3 billion, has also won praise for his work as a major supporter and president of FC Krasnodar, a major player in Russian soccer.